This paper will explore ways HPC systems are being used in a wide range of business domains and disciplines to solve complex problems efficiently with related research and statistics. 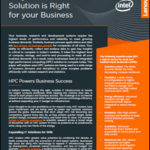 Download the new report from that explores why a HPC solution may be the right choice for your business. Like many other HPC workloads, deep learning is a tightly coupled application that alternates between compute-intensive number-crunching and high-volume data sharing. Intel explores how the Intel Scalable System can act as a solution for a high performance computing platform that can run deep learning workloads and more. Intel outlines the highlights and features of the company’s new Intel Xeon Scalable processors designed to accelerate HPC systems. The Intel Xeon processor Scalable Family, the newest Intel Xeon processors, are optimized to address today’s most demanding high-performance computing challenges. 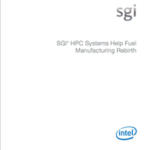 Manufacturing growth is being fueled by the adoption of computer aided engineering (CAE) and analysis solutions powered by high performance computing (HPC)—especially by the Tier One manufacturers. HPC is beginning to make some inroads into the ranks of the small to medium sized manufacturers (SMMs), but the going is slow.